When it comes to entertaining the family Whistler is a real-life winter wonderland. Your kids will be delighted to learn there is even more to the largest playground in North America than expected. Here is a list of what not to miss to help you create the best memories from your day time and time again. Reduce the morning lines by completing everything you can the night before. This includes collecting rentals and buying and printing of passes and tickets. There is no need to test the patience of the family when you could be making your way up the mountains at 8.30am. Some of the best conditions for skiing can be found in the first hour so by following this advice you will start your day the right way. Fresh Tracks is a neat trick for an early start up the lift. TELUS Fresh Tracks allows an hour head start by uploading the legendary Whistler Village Gondola at 7:15am. While the rest of the village wait down below you can enjoy a sunrise from the Roundhouse Lodge with an all-you-can eat breakfast buffet including eggs, bacon, pastries, yogurt, fruit and unlimited coffee. Escaping the crowds is addictive and if you’re enjoying the conditions then be sure to schedule lunch before 12pm or after 1.30pm. Between these times the best tables are taken and the lines are longest in the restaurants and alpine huts. While everyone else is reenergizing your family can enjoy the quieter times in the mountain play areas. With more than ten different options on the mountain for food, from fine dining restaurants to grab & go shacks, it’s easy to find something for the fussiest of eaters. 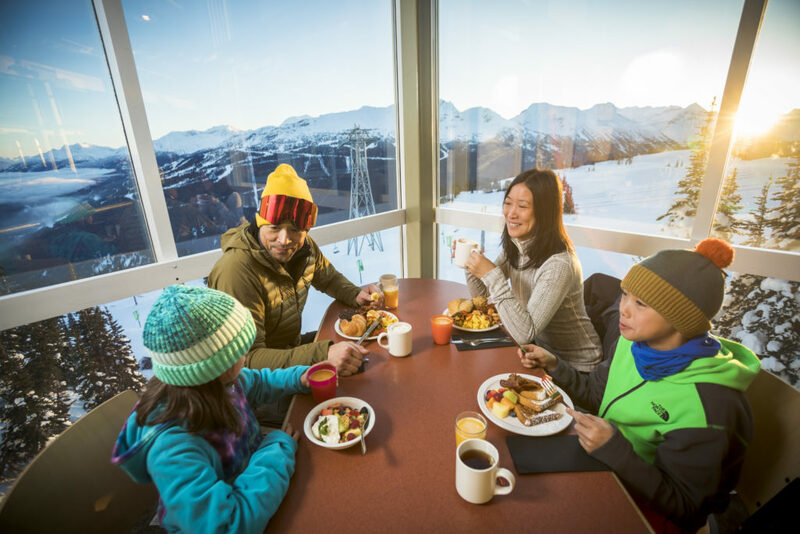 On Blackcomb you will find full service dining at Christine’s. The restaurant offers mountain comfort dishes from local ingredients paired with world class wines. Cleverly designed seating means that panoramic views are available from anywhere in the restaurant. On Whistler fine dining is possible at Steeps in the Roundhouse Lodge. The menu is locally sourced from fresh ingredients and paired with local wines from British Columbia. The restaurant is host once a month to the Winemakers Dinner which is a coveted event for guests wanting to discover the best of local seasonal foods and with a taste for fine local wines. The Alpine Huts are equally as welcoming with a variety to offer. Ollie’s Grilled Cheese in the beginners area at Olympic mid station is worth the stop on the Whistler Village Gondola. The grilled gourmet sandwiches are a favourite with children and parents alike and not to be underestimated. Further along the expressway and you will find the vegetarian Raven’s Nest. One of the first of its kind in North America the menu has adventurous twists to plant-based food with optional meat extras. It is hard to predict where will be the family favourite with multiple unique menus across the huts and shacks. TELUS Fresh Tracks at Roundhouse PHOTO: Justa Jeskova. 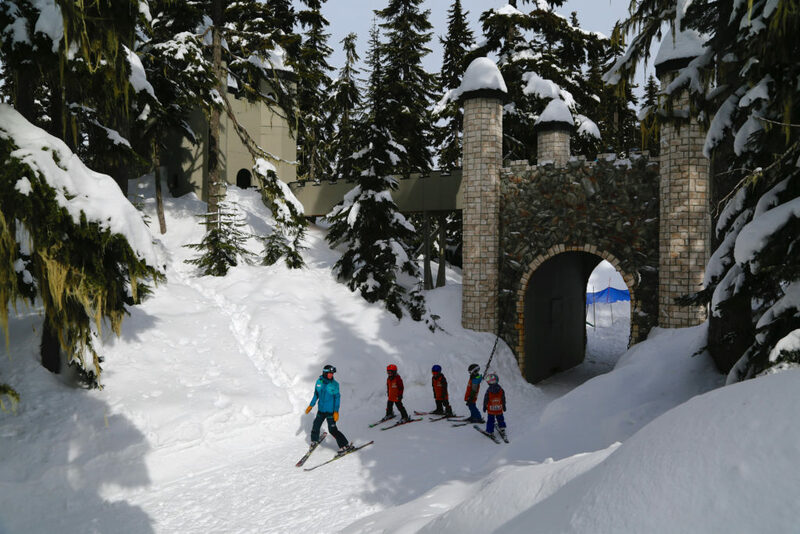 There really is more than expected to discover on the ski slopes at Whistler Blackcomb. The GMC Race Centre on Blackcomb Mountain is your opportunity for family friendly competition. The Dual Slalom course is free to use and the timed runs are set on an intermediate slope to include everyone. If you learn that you need some help keeping up with the rest of the family you have two options. The first is a private or group lesson with the snow school instructors. All abilities are catered for and the lessons are a fun way to work on technique while discovering new parts of the mountains. The second option is to ski or ride with an Olympian for a once in a lifetime experience the family won’t forget. There is no excuse for being left behind the rest of the family this winter. 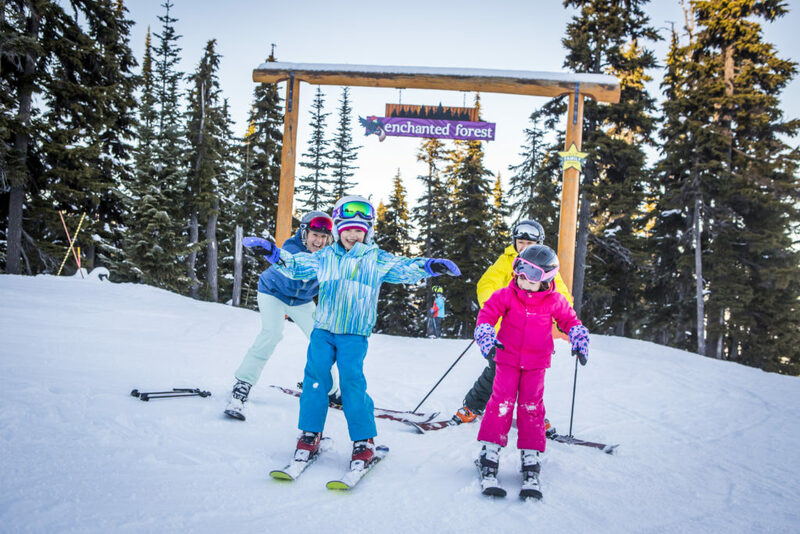 A great place to practice new skills is the Family Zone practice area on Whistler Mountain. The kid friendly activity zones are highlighted on the Alpine maps which are an essential item when playing on the mountain. Imagine the excitement on your son or daughters face as skiing down a slope unveils the Tree Fort or Magic Castle play area in the mountain forest. The Tree Fort on Whistler Mountain and the Magic Castle on Blackcomb are both easily accessible. The Coca Cola Tube Park is open until early evening at the heart of winter. While sliding down multiple fast paced lanes you will be reminded of the tobogganing from your youth but with a fun new twist. Multiple lanes with different speeds are available and racing is encouraged. The park is at the base of Blackcomb Mountain and easily accessible from the Village as well as the slopes. There is no skill or previous experience necessary to enjoy this activity. Just your natural sense of adventure. Further entertainment is available while warming up off of the slopes too. Nintendo Gaming Lounges are fitted at the base of Blackcomb Mountain and in the Rendezvous Lodge. The games consoles entertain all ages and feature both recent and popular games. You can recharge your electronic equipment at these locations so you’re able to continue capturing moments long into the afternoon. The Fire & Ice show is the highlight of the week for many families. The event takes place on Sunday evenings through winter in the village and is free for the whole family. The show features world class skiers and snowboarders from the local area performing big air tricks and jumping through rings of fire. On some nights you can expect fireworks too. On weekdays the Family Après event in the Whistler Olympic Plaza is a showcase of friendly Canadian fun including snowman building, tobogganing, hockey and warm hot chocolates. The fun continues long into the evening in Whistler with après at base restaurants family friendly until 10pm. The GLC in the heart of the village features a patio facing the slopes and has won many local awards including best après, best patio and best place to see live music. Dusty’s in Creekside is the favourite of many locals for its sunny patio and mouth-watering BBQ dinners. Finally Merlin’s at the base of Blackcomb has Canadian cabin charm with retro décor. The laid-back atmosphere is the setting for many fine evenings in the upper village. The EpicMix app partnered with TELUS free Wi-Fi at select locations on the mountain make it easier than ever before to stay up-to-date with conditions across both mountains. The app can pinpoint your location to help you find your way if conditions are against you. It makes getting lost in the powder even more attractive. In addition the app stores data including how many runs and vertical feet you have completed plus it can show you current lift line times to keep you ahead of the crowds. If you are lucky enough to have the option of choosing when to visit this rough guide to what happens when will help you decide which season is for you. The lifts open November 22nd and from then until Christmas is the early season. The terrain will expand so although not everything is open it’s the first chance to see what is being prepared for the winter. The anticipation is high, the lines are small, and the abundance of early snow fall make this a great time to visit. From Christmas through to January is a popular time for families due to the many events and celebrations taking place on the slopes and in the village. There is a lot of energy in the village and with most of the terrain open the largest playground in North America is looking fine. If your family are looking for the perfect skiing conditions then February and March is when the ‘powderhounds’ can be found in the village. The locals know March as ‘powder month’ and if you visit at this time you best buy or rent powder skis. The snow is deep and the conditions showcase how Whistler built its reputation. Finally followed by ‘Spring Skiing’ if you like the sound of warm weather and longer days then you’ve found your perfect vacation period. The terrain won’t be as vast but as the World Ski & Snowboard Festival arrives in town there is still plenty of challenging terrain for all abilities amongst the family. 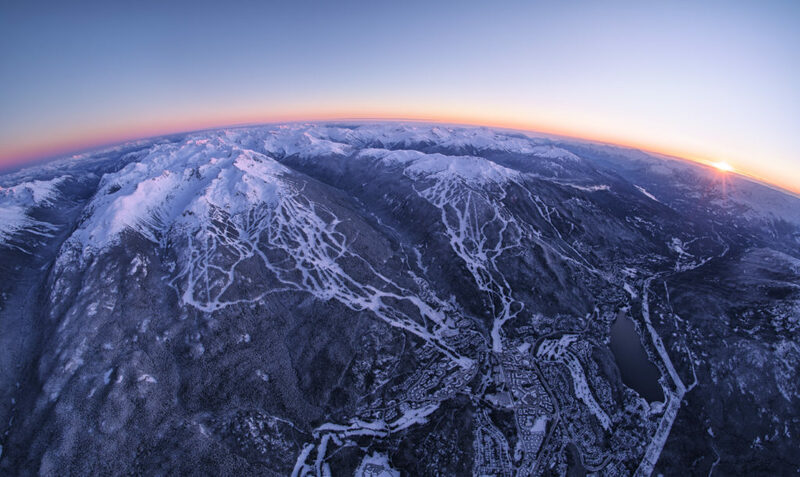 Check out the Whistler Blackcomb website to buy lift tickets and find out more information about events on the mountain.